As the (still daily) showers continue and the garden further saturates with water, a set of plants enjoying all the moisture are the ferns. We have a few different types and it’s about now that they start launching new “tendrils” that will unfold to become this year’s fronds. This one is nestled by the trunk of the ornamental cherry. I’m fascinated by the way different plants unfold, unroll, unfurl, uncoil, grow new leaves, there seems to be countless ways of doing it. 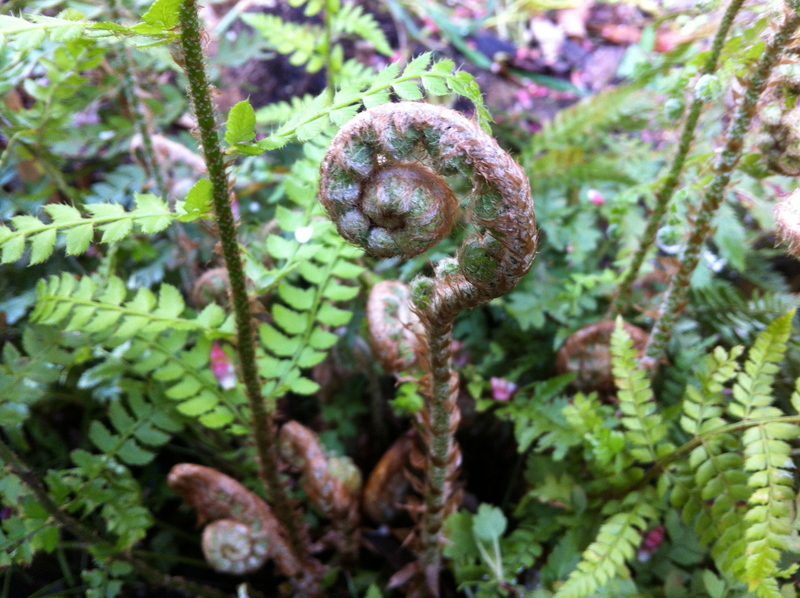 Ferns look particularly unusual and spectacular when they grow new leaves like this each spring. There’s a couple of Japanese Painted ferns that I need to move (rescue) as they don’t grow very large and they’re being smothered by other plants around them so they’ll have to planted somewhere more visible. I also have an idea for a pot by the front door – I want to put a large fern in it – to brighten it up. The front door faces north and never gets sun, so it should be ideal.